Swim with sharks, eels, rays and other fish while experiencing the Aquarium from the inside out. 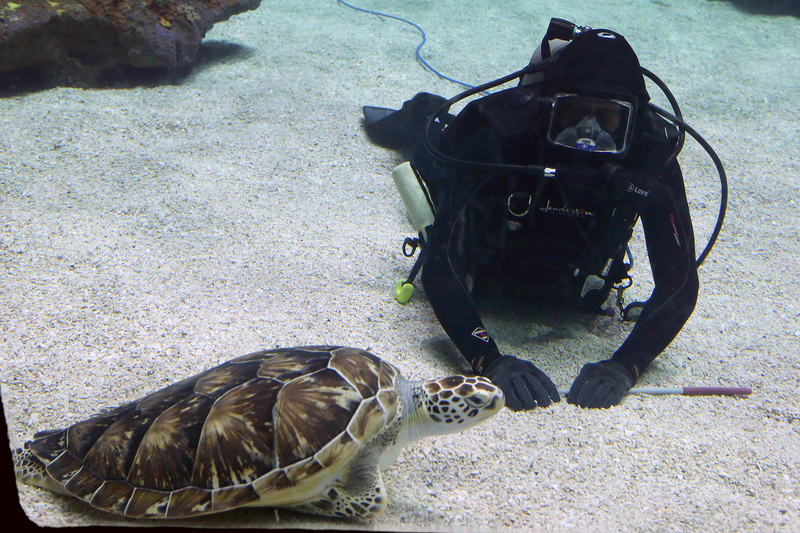 The NC Aquarium at Fort Fisher’s volunteer divers provide the personal connection between guests and marine life. Dive volunteers assist with routine cleaning and maintenance of exhibits. After training, some volunteers present educational programs during our daily Dive Shows. Dive volunteers must be 18 and older and be SCUBA certified. All diving equipment is provided and no specialty training is required. Treading water for 10 minutes or treading water for two minutes without the use of hands or aids. This skill is to be completed after the 200 yard swim. After completing the swim test, volunteers will perform an underwater SCUBA skills test at the Aquarium. Having successfully finishing the physical, swim test and skill test, volunteers become a probationary diver. Probationary divers will train with the Dive Safety Officer, who will assess the diver’s abilities and refresh basic SCUBA knowledge. Probationary divers are expected to learn what it means to be a diver working on a team and need to complete at least 12 dives during their training period. A formal assessment will follow. After being cleared from probationary diver status, volunteers become a permitted diver and will be assigned to and fall under the leadership of a team. Questions about becoming a dive volunteer? Download the Volunteer Diving Manual and contact Volunteer Coordinator at [email protected] or (910) 772-0506.